The acer palmatum or Japanese maple is a deciduous shrub or tree native to Japan, Korea, China, Mongolia and Russia. They are often cultivated for their aesthetic beauty, colour and vivacious foliage. A Japanese maple usually grows between 6 and 10 meters tall. Add style and some lofty autumn colours to your garden and your life! For Japanese maples to flourish, they need not be in direct sunlight all day long, right away, but more of an afternoon’s balance of sun and shade every day to boost their growth. Too much sunlight will cause the leaves of your Japanese maple to scorch and die, and too little sunlight will give less than the optimal colours you might be expecting in your leaves. It may take time to perfect the balance your tree needs, and you shouldn’t be surprised if you find that another location in your garden is more suitable for it: digging it up and transplanting it somewhere else is a breeze. This process is about finding the best spot for your tree to take root, and moving it a few times won’t do it any harm. You also want to keep your tree safe from high winds because the foliage of the Japanese maple is very fragile and will dry out quickly. As long as the shrub isn’t pitted against extreme winds, it will grow wonderfully outdoors. The last concern for growing your Japanese maple is the kind of soil being used. These trees do not do well in salty or high alkaline soils. Keeping your tree deeply watered and well soiled will ensure that it grows beautifully. To keep the Japanese Maple happy and healthy the soil must be well drained to thrive. This photo was taken with my mobile phone in a nursery in Albury Australia. Very pretty leaves and trunk. There are several varieties of dwarf Japanese maples that are perfectly suited for growing in pots or containers. 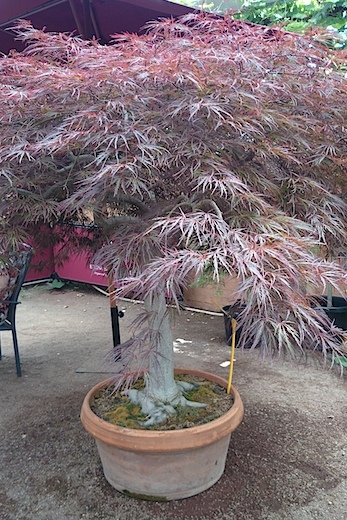 Growing a potted Japanese maple is a great place to start for someone not too familiar with the shrub. Your pot should provide great drainage and be big enough for the rootball to fit. Plastic pots are best because they will not crack or break in frigid winter temperatures like terra cotta or ceramic pots would. You’ll need slightly acidic, well-draining potting soil to grow your potted Japanese maple. You can fertilise your tree weekly through spring but you don’t want to encourage new growth too close to winter when it can be easily damaged. should be easy, and because it is a fairly low-maintenance shrub, it shouldn’t require annual work. The best policy with Japanese maples is to leave the young, budding tree to grow as long as possible before performing any upkeep. You should inspect your tree as you see fit and remove dead branches, but less is truly more here. Japanese maples are very strong in general and aren’t usually affected by disease, but there are several pests that could prey on your tree. Scale, mealy bugs and mites are the most common enemies of your tree and they can be treated with water and regular organic or chemical pesticide treatments. Canker, a fungal infection, and other maple diseases may affect young trees, but older ones usually recover. Pruning and regular care for the tree will eliminate most of these issues. With a little effort, you can have your garden shimmering with an autumn glow. Hello, I was wondering how it is possible to grow Japanese Maples in Australia if there is no dormancy period for them? Hi, I was wondering how it is possible to grow Japanese Maples in Australia, without a dormancy period? Hi Evan, the tree won’t die, you just would not get the full affect of the autumn leaf colours of the Japanese maple tree in autumn which they are mainly grown for, Christine.